The Si47xx series of integrated circuits from Silicon Labs is a fascinating series of consumer broadcast radio products, chips that apply SDR technologies to deliver a range of functions that were once significantly more complex, with minimal external components and RF design trickery. [Kodera2t] was attracted to one of them, the Si4720, which boasts the unusual function of containing both a receiver and a transmitter for the FM broadcast band and is aimed at mobile phones and similar devices that send audio to an FM car radio. The result is a PCB with a complete transceiver controlled by an ATmega328 and sporting an OLED display, and an interesting introduction to these devices. 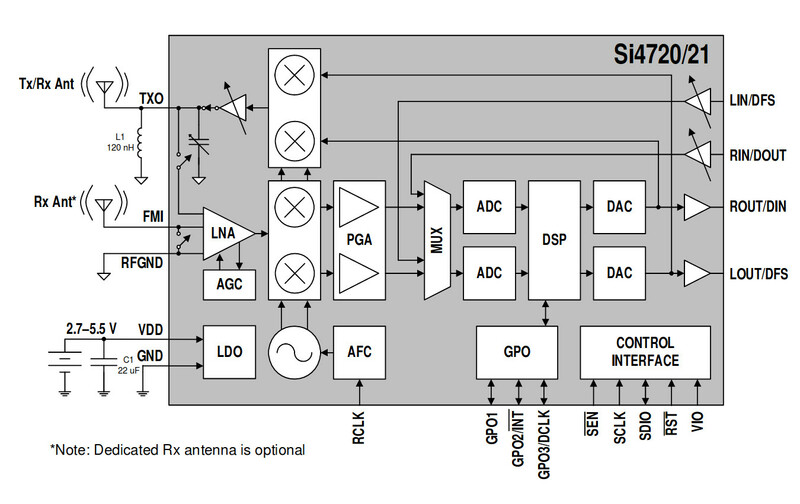 The Si4720 internal block diagram, from its data sheet. A look at the block diagram from the Si4720 reveals why it and its siblings are such intriguing devices. On-chip is an SDR complete in all respects including an antenna, which might set the radio enthusiasts among the Hackaday readership salivating were it not that the onboard DSP is not reprogrammable for any other purpose than the mode for which the chip is designed. The local oscillator also holds a disappointment, being limited only to the worldwide FM broadcast bands and not some of the more useful or interesting frequencies. There are however a host of other similar Silicon Labs receiver chips covering every conceivable broadcast band, so the experimenter at least has a good choice of receivers to work with. If you need a small FM transmitter and have a cavalier attitude to spectral purity then it’s easy enough to use a Raspberry Pi or just build an FM bug. But this project opens up another option and gives a chance to experiment with a fascinating chip. [Jordan Wills] was tasked by his company, Silicon Labs, to build some Christmas Baubles to give away to co-workers. While the commissioned units were designed to be simple battery and LED affairs, he decided to make one of his own with bells and whistles. His Mario themed Christmas Ornament uses a Silicon Labs FM972 micro controller, capacitive sensing, PWM controlled 8 bit audio, and blinky lights. The interesting part is some of the construction techniques that he used. The finger-joint style cube is built from circuit boards. Electrical connections between panels were routed using solder wicking copper braid. That’s a interesting trick which we’ll keep in mind along with some of our favorite creative structural uses of PCB. The top of the cube has four LED’s which light up the Mario “Question Mark” symbols on the four sides of the cube while the base contains all of the electronics. The outside of the base piece was a large copper plane to act as the capacitive sensing element. This meant all electronics needed to be surface mounted with tracks laid out on one side – which posed some layout challenges. Adding the Capacitive sense function was a cinch thanks to support from the in-house design team. PWM output from the micro controller takes care of audio, and the output is routed through a buffer to boost the signal. A bandpass filter then cleans up the PWM output before feeding it to the speaker.